I had to take a class in accounting before I understood the difference between sales and earnings. Fortunately, learning about Amazon Mobile App Distribution Program sales and earnings reporting is quite a bit simpler than that accounting class. 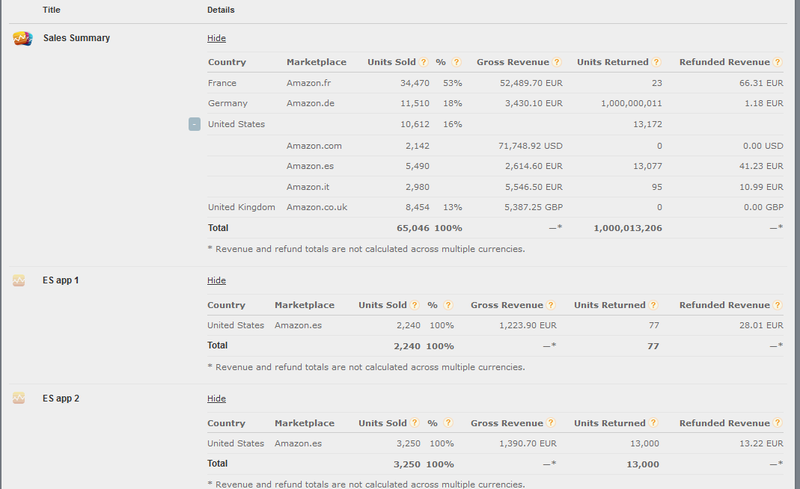 Sales reports – show basic sales less returns over customizable time periods and countries. Earnings reports – show more details (including adjustments) in a fixed one-month period. Payment Reports – show you what you are actually paid every month. Sales Reports show trends in sales and returns over standard or custom time periods. You can get daily breakdowns in CSV reports, and you can see sales broken out by individual marketplace or by the almost 200 countries in which you app could be sold. Data in sales reports are updated every few hours but do not reflect processed financial data for the current month. They do not include adjustments and other data that will affect your payment. Below are two examples of reporting that can be customized by app and international marketplace. The first is a map view. Note the drop-down buttons for ‘Date’, ‘All Apps’ and ‘All Marketplaces’. These let you show a specific date range and show sales by marketplace (like amazon.co.uk or amazon.fr) or by the country (such as Brasil or Norway). 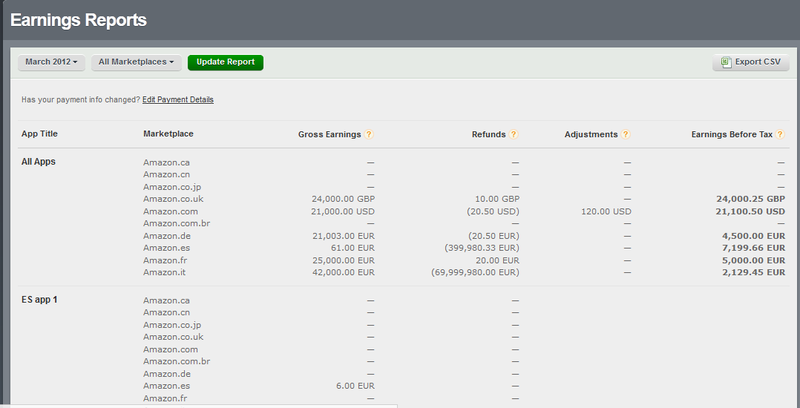 The next example shows a tabular view of the Sales report with detail such as Units Sold, Units Returned, Units Refunded and Gross Revenue. Earnings Reports represent the sales, refunds, app earnings and adjustment data used to calculate royalties earned during a given month. Data in earnings reports are released on a monthly basis once royalties earned in the previous month have been processed and approved. Monthly summary information is available in the Amazon Mobile App Distribution Portal and daily breakdowns are available through CSV export. Payment Reports represent the actual disbursement of funds from Amazon. Monthly summary information is available in the Amazon Mobile App Distribution Portal on the payment reports section. Accessing Reports Getting these reports is easy. Log in to the Amazon Portal and click on the Reporting link (shown below). Then select the report you want, then select your customization filters below that. The Amazon Moblie App Distribution Program gives you useful reporting data that is pretty easy to access and understand. My accounting teacher would be proud. Try getting a few reports now, and see how easy it is to get data on your apps today. Some say the best developers code well because they optimize for their own laziness. They’ll invest time up front to automate a repetitive process, or extend existing code that gets them part way to where they want to be. In truth, most also struggle with the demon of NIH—Not Invented Here—because building something from the ground up scratches a programmer itch. It’s a fine line. As the popularity of mobile devices has grown (exploded, actually) and mobile applications capture more and more eyeballs, competitive pressure is forcing more aggressive timelines. Many developers are leveraging game and application engines to speed time to market. As added benefits, these frameworks often simplify cross-platform development and reduce QA time as well. Some game engines include sophisticated modeling environments that do the heavy lifting of code creation in the background, allowing you to concentrate on the story and game mechanics. They provide shortcuts to common patterns used in popular genres such as side-scrollers, puzzle games, and shooters. Engines can help you create apps for multiple platforms simultaneously, automatically generating platform-specific code as the app is designed. In many cases, all you have to think about is how your game will appear at the various screen resolutions available on different devices. Most engines have plug-ins or extensions designed to allow easy integration of services like Amazon GameCircle, Insights, and In-App Purchasing. These service APIs can be pre-configured and included automatically when an engine-based project is built, so they don’t have to be added in a separate step. Cocos2d-x (http://www.cocos2d-x.org) is a free, open-source 2D game engine based on C++. It supports multiple platforms, including Kindle Fire and iOS devices. A GameCircle extension to Cocos2d-x is included in the Amazon Mobile App SDK, simplifying integration of leaderboards, achievements, and Whispersync for Games into your Cocos2d-x projects. For more information about our Cocos2d-x extension, see Amazon GameCircle Cocos2d-x Extension. Corona SDK (http://www.coronalabs.com/products/corona-sdk/) is a 2D engine that allows developers and hobbyists to create games, as well as apps of other types, such as business, utility, education, productivity, etc. Using Lua, you can build and package apps for Kindle Fire, Android, iOS, and Nook using industry standards like OpenGL and Facebook APIs. Corona Enterprise SDK adds support for Objective-C and Java. For more information about using Corona SDK with Amazon Kindle, see Signing and Building — Kindle Fire. Unity3D (http://www.unity3d.com) is one of the most widely used and highly regarded 3D game engines for targeting mobile, web, desktop, and dedicated hardware such as smart TVs, set-top boxes, and consoles. Recently, Unity announced that Android developers can build games and apps with their engine for free. Unity includes a powerful 3D rendering environment featuring modern graphics and animation, and the Amazon Mobile App SDK includes Unity3D plug-ins to support GameCircle and In-App Purchasing. For more about the Amazon store and Unity3D, see Amazon GameCircle Unity Plug-In and In-App Purchasing Unity Plug-In. Many more game and application engines are available in addition to the ones listed above, some supporting Amazon services and Kindle Fire devices. Check your favorite engine for more information. The engines are running… the green flag is up… Go! If you have decided on publishing an interactive periodical title, congratulations! Having an interactive periodical means that users can scroll articles on a page, play a music sample, manipulate a map, or otherwise interact with your content in ways that are just not possible with static content. While interactive publications are more work than simply rendering a PDF replica of your print publication, they are often well worth the extra effort. Interaction can drive deeper engagement with the content, more time per page, better reader usage reporting and other advertiser-friendly benefits. In this two-part series on Interactive Periodical Publishing on Kindle Fire I will discuss some of the technical considerations for those who will write their own periodical application or who will use a publication platform such as Woodwing or Adobe. The first part introduces thoughts on layouts, resolutions and interactions, and part two will cover how to submit your periodical app to the Amazon Appstore to minimize time investment on your end and optimize user experience. If your content is text-centric, you can look into using a fluid layout (Liquid Layout) design. 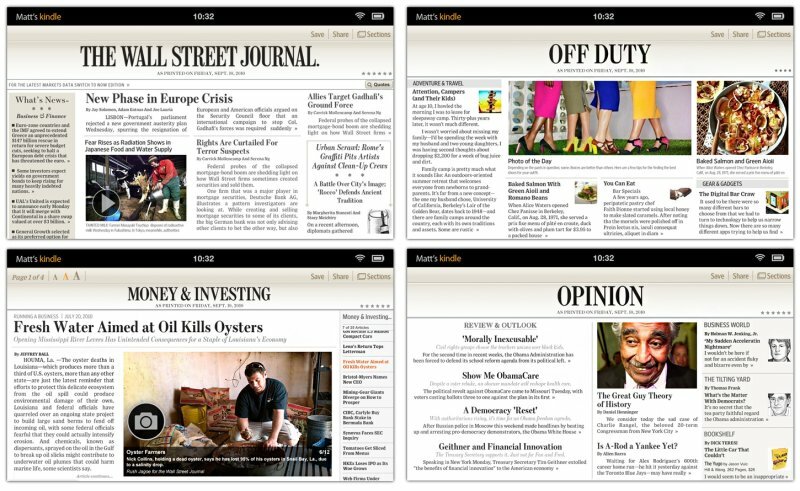 The Wall Street Journal app for Android and iOS uses a set of relative layout templates into which the daily text of the newspaper flows. Once your templates are set, you can simply stream content and the templates handle the layout. 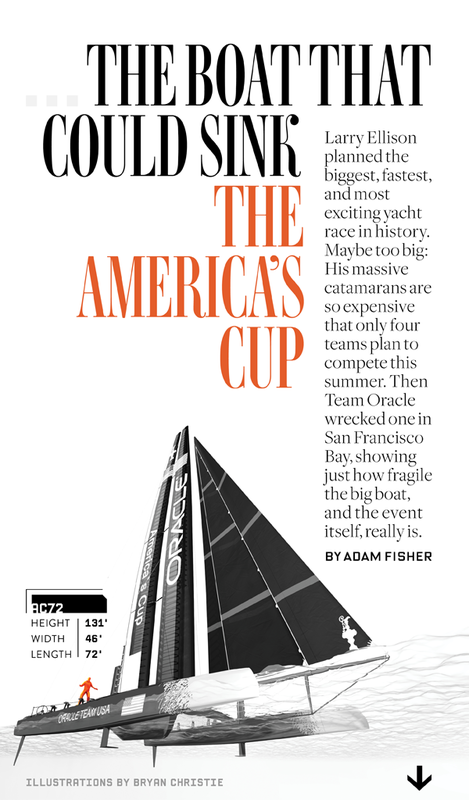 If your periodical is image-heavy, or you wish to exercise more exacting creative control, you can probably constrain your digital layout work to two fixed aspect ratio layouts, one for the 4:3 aspect ratio iOS tablets, and another 16:9 layout for Android tablets. True, not all Android tablets are 16:10, but if you are comfortable with a small amount of letterboxing, non-standard devices can be accommodated. Publication platforms like those from Adobe can take a specific layout from InDesign and generate multiple renditions in which you can bundle images that are specific to the screen resolution of the target device. This can help reduce total package size and reduce asset scaling artifacts. Other platforms ask that you submit the largest assets you have, and will then scale down the assets to match the screen resolution of the target device. If you write your own app, you can make either choice, or even stream appropriate images to your app if your application returns the properties of the device on which is it running. If you do write your own app, please be aware that periodicals are often read in both landscape and portrait orientations. Your app should accommodate accordingly. If you are creating your own app, you can use just about anything you want to create interactions; Native code, Java, HTML, even HTML5. If you are using a platform like Adobe, you still have a fair amount of flexibility within the scope of the tools and webkit provided by the platform. In either case, be aware that the code you put onto any single page will use heap memory, and if you cache multiple heavy pages at the same time, you could find yourself running short on memory and fighting with the garbage collector should you ever hit onPause(). Avoiding this usually requires coordination between the content folks (who usually don’t think about heap size) and the IT group (who usually don’t think about editorial requirements). If you can flatten some of your non-interactive elements to PDF, you can save a good deal on file size and memory usage. That covers (at a very high level) some of the important considerations to keep in mind when designing your periodical app. The next installment of this series will cover submitting your app to the Amazon Appstore, setting up In-App-Purchasing for subscriptions and individual issue sales and more. It’s no secret that customer satisfaction is key to Amazon’s success. It’s something we obsess about, and we constantly tweak everything from product selection to payment options to website design. 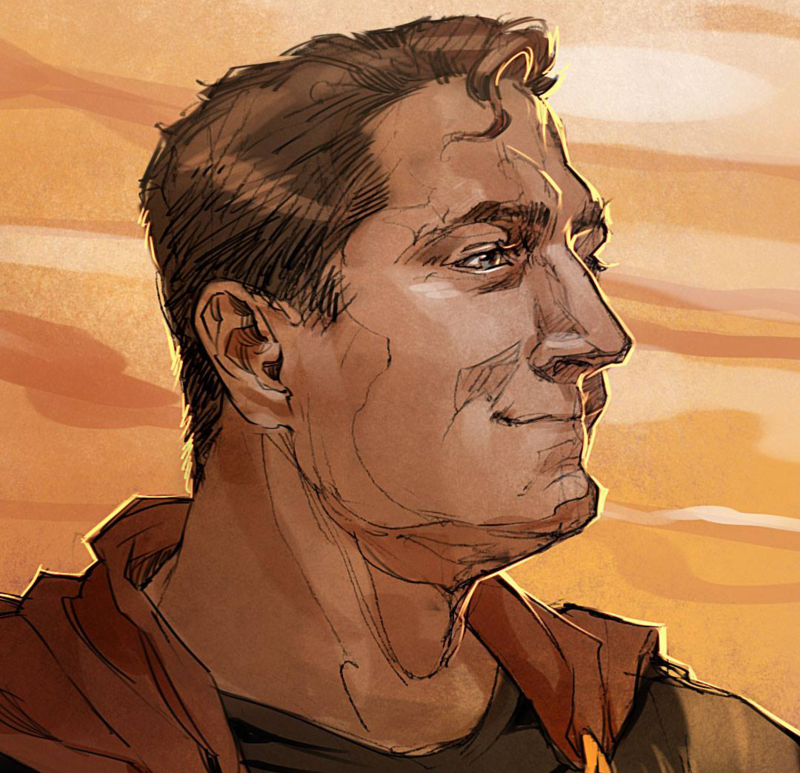 We experiment, we measure, and we decide whether or not a change improves the user experience. One of the most powerful tools at our disposal is something we call a Web Lab, which allows us to test two (or more) different versions of a webpage, or roll out a new feature to a limited audience. Perhaps this concept is less familiar to mobile application and game developers than to those who write web code, but it shouldn’t be. In fact, it’s so useful and important that Amazon’s A/B Testing service was one of the first we made available to mobile developers (If you haven’t tried the service yet, check out Getting Started with A/B Testing for a quick introduction). Now a significant enhancement has just been released: Segmentation offers greater flexibility and control over who sees your experiments, allowing you to limit your tests to a set of users based on any dimensions you care to associate with them. A “dimension” in this sense is simply a named characteristic whose value is a number or a bit of text. The UserProfile singleton object manages the dimensions you define, keeping track of their values for the current user. It’s these values that determine whether the current user is a member of a particular segment, and it’s entirely up to you how they are chosen, named, and initialized. // Set the dimension for the current user. 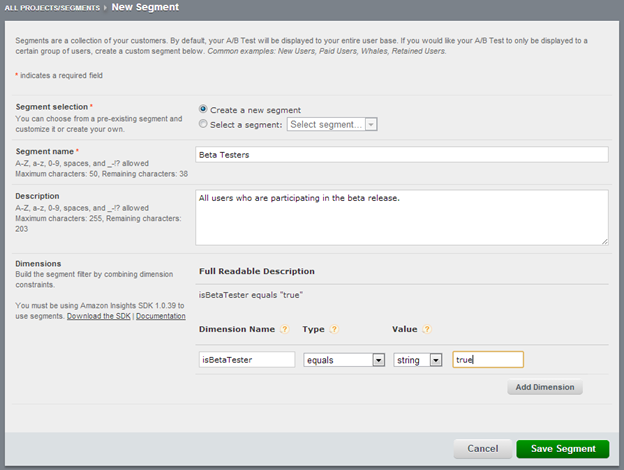 // Initialize the Insights SDK to enable A/B Testing. In this case, validateUserAsBetaTester() is a helper method I define to assist me in deciding whether the current user is a beta tester or not. This could be a preferences setting, or perhaps a check against an email whitelist. Regardless, I’m responsible for setting the value, which I do before initializing the A/B Testing system. Now that I’ve established a dimension to differentiate users, I need to define a segment that actually refers to it. The segment may be associated with any A/B test, limiting access to users who match (or don’t match) along the relevant dimension. From the Amazon Mobile App Distribution Portal, I navigate to the A/B Testing tab of my app, then click Add a New Segment. For users outside the Beta Testers segment, the control variation will always be allocated. However, these users will never be included when the results of the experiment are calculated. In this simple example, a single boolean value was enough to distinguish segment members, but segmentation supports much more complicated criteria. 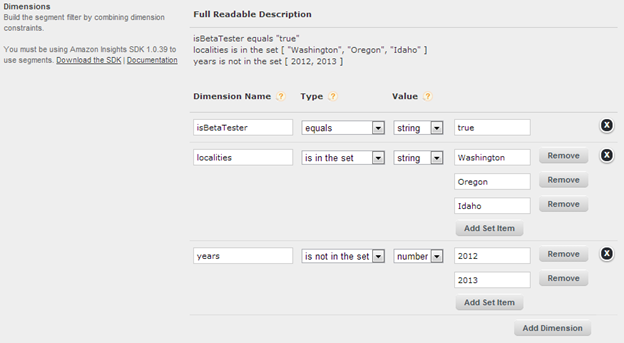 You can easily attach more than one variable or change how variables are evaluated. String equality works as demonstrated (numeric equality is identical), but it’s also possible to create a segment based on a numeric range or set membership. Setting up segments is simple and adds a lot of flexibility to your experiments. Give it a try the next time you’re considering A/B testing. For information, be sure to check out the Insights documentation. Navigate into your app. Click “My Apps” on the navigation bar of the Mobile App Distribution Portal to access your list of apps. On the detail page of your app, click the “A/B Testing” link as shown below. A screen displaying your list of A/B projects is displayed. Click “Add a New Project”. Enter a title and description that indicates this test is used for the launch of a specific feature and click “Save Project”. 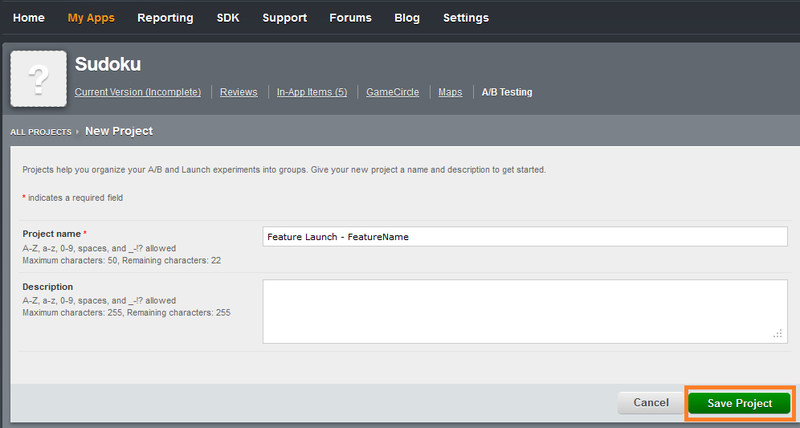 Click “Add a New Launch” on the detail page of the project you just created. We are now looking at the page for creating an A/B launch. Enter a name and description that indicates this is used for a feature release. For the variable, we create a boolean that tracks whether the feature is enabled. The old variation is set to false and the new version is set to true. Make sure to keep the old variation set to 100% of the distribution. This means all users of your app will not have the feature enabled when you check this A/B launch’s variable. Click “Save” to add your A/B launch. Click the “Start” button on the newly created A/B launch to make it available for use. We now have an A/B launch containing a corresponding variable for determining whether our feature is made available. The next step is to integrate the A/B Testing SDK into our app using the following steps so we can write code to obtain whether the feature is made available. Download the Amazon A/B Testing SDK from here. Set the required permissions INTERNET and ACCESS_NETWORK_STATE in your AndroidManifest.xml file. Add the Amazon Insights Processing Service to your AndroidManifest.xml. Add the AmazonInsights Android SDK jar and all 3 AWS Android jars to your Android project. These jars can be found in the libs folder of the SDK download. With the SDK setup its time to add code to either make our feature hidden or available based on the variable we configured for our A/B launch. The steps below detail the code needed for accomplishing this. Import Amazon Insights in to your code. Initialize the Amazon Insights SDK in the onCreate method of your Activity. Note: Your application key and private key can be found on the Amazon A/B Testing page for your application where we created the A/B project in step 1. 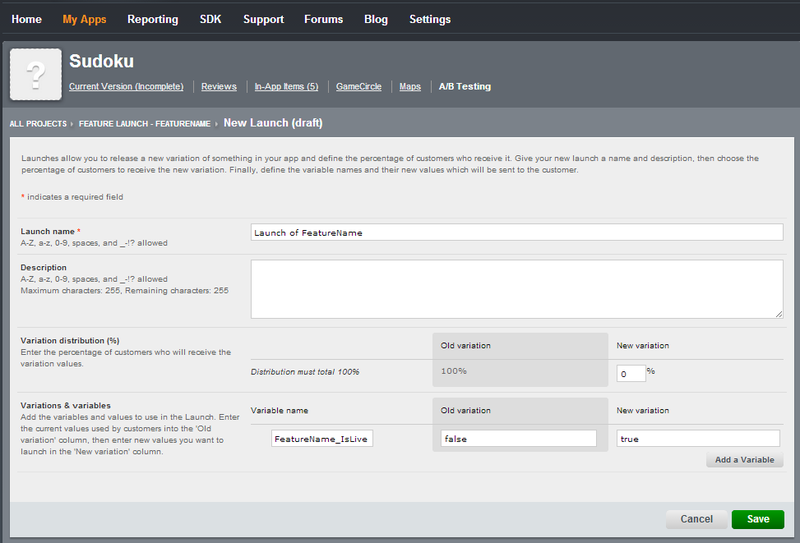 Add code to enable the feature based on the A/B launch variable. 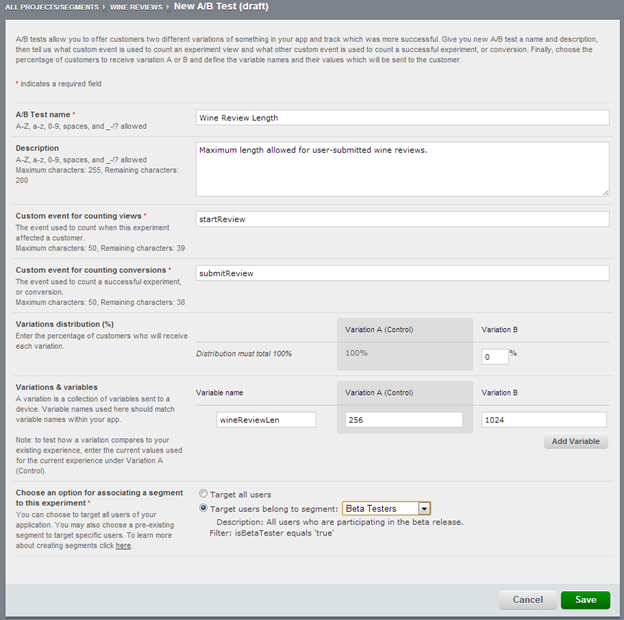 We obtain our A/B launch variable and check whether we should enable access to the feature. //for whether the feature is made available. Navigate back to the A/B launch experiment you created for your app’s feature release. This is accessible by clicking the “A/B Testing” link on your app’s detail page. Next click on the current experiment for our feature launch A/B project as displayed by Image 8 below. Click the “Edit” tab to change the distrubtion of the variable we use to determine if the feature should be made available. When the Launch was created the distribution was set to 100% to the “Old Version”. Change the distribution of the new variation to 100%. All users of your app are going to receive true for the variable used to enable your feature. 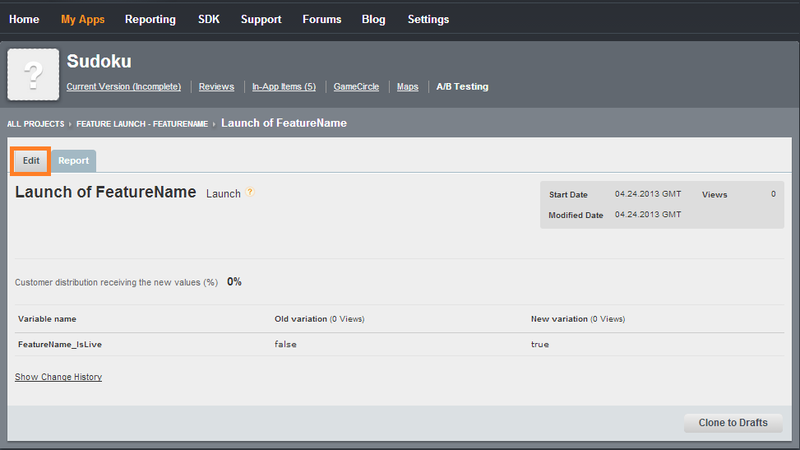 Click “Save Launch” and your feature will now be live for all users. In some scenarios you might want to incrementally release a new feature over time. This can beneficial when releasing features for which scaling might be a concern. For example, you can use Launch to safely increase the percentage of customers receiving the feature while you monitor the scalability of your service. If a problem is detected you can stop incrementing the release or in an extreme case pull it back. That is all it takes to support releasing a feature via Amazon A/B Testing in your Amazon app. You can find more information the Amazon A/B Testing service here. You may have seen the news that our store is expanding to nearly 200 countries. As we grow, we continue to focus on developer success around the world. 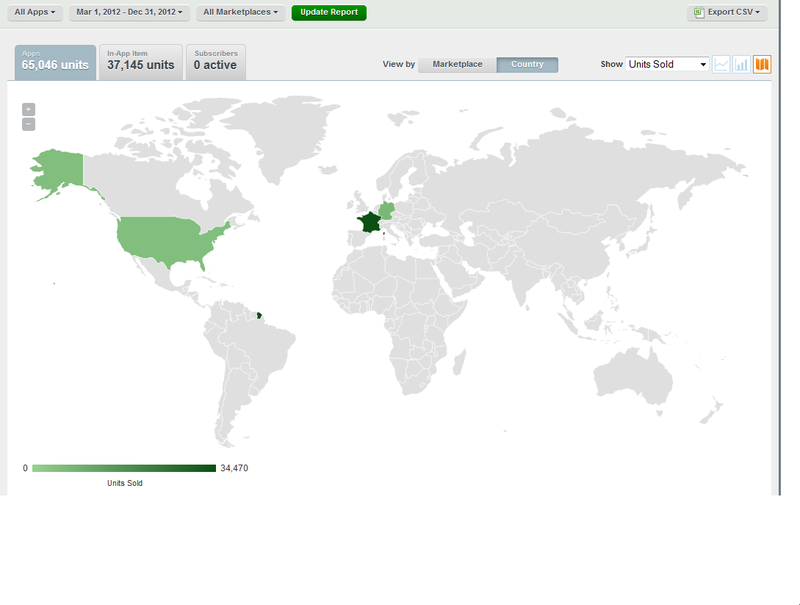 We’ll be spotlighting developers from countries in which we operate here on our blog over the next few months. First, we take you to the UK, where just six months after the launch of the store on Kindle Fire in October 2012, British developers and publishers are already seeing some impressive results. Kent-based P2 Games publishes titles based on popular children’s character licenses, including Peppa Pig (the UK’s leading pre-school franchise), Fireman Sam, and Bob the Builder. P2 Games was already successful before Kindle Fire launched in the UK, but saw sales quickly grow once the store launched in their home market. Although P2’s Peppa Pig Apps have already been downloaded more than one million times since launching in September 2010, they achieved some terrific results just months after the launch of our store in the UK. Publishers like P2 Games tell us that one of the reasons they are turning to Amazon is because it monetizes so well. P2 Games is just one of thousands of UK-based developers and publishers that have already experienced the value of connecting with Amazon customers on mobile devices, and are reaping the rewards of distributing apps on Kindle Fire. Developers benefit when customers find the apps that interest them through behavioral recommendations and buy ‘friction free’ through 1-Click purchase. The Amazon Mobile Ads API now includes the Auto Ad Size feature, which automatically selects the appropriate ad size to display based on the user's device and your app’s ad layout. Auto Ad Size significantly reduces integration and testing time for each app, and it provides a better user experience. Sign in to your Distribution Portal account. If you do not already have one, you will be prompted to create an account. Get an Application Key by clicking on your app under My Apps or adding a new app. Download and integrate the Amazon Mobile Ads API. Submit your app for approval. Adding advertising to your apps is easy. Integrating ads doesn’t require a major redesign of your app and has minimal impact on your app’s functionality. It is as simple as making space for the ad on the screen. The Amazon Mobile Ads API (Beta) enables you to display high-quality ads provided from the Amazon Mobile Ad Network in a matter of minutes. 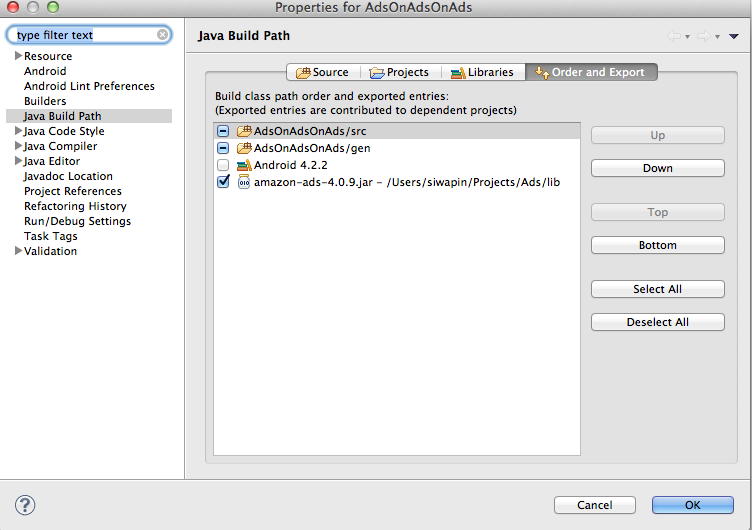 This article explains how to place ads into an existing app using the Amazon Mobile Ads API. First and foremost, submit your payment information through the Payment Information Page and your tax information through the Tax Identity Interview. You can skip this step if you have already submitted this information through the Amazon Mobile App Distribution Portal. This is required to receive ads. 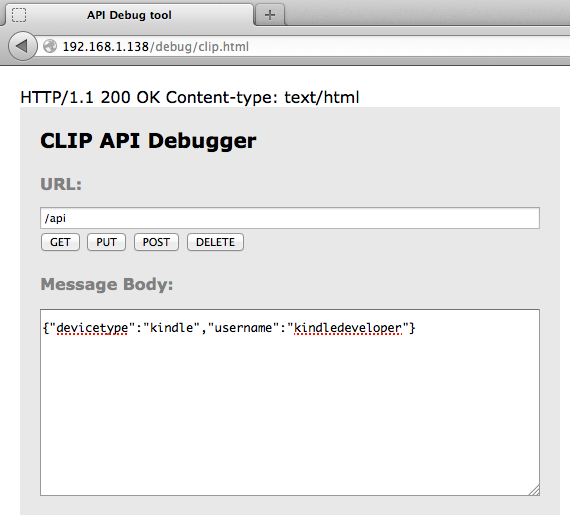 The Amazon Mobile Ads API utilizes a unique Application Key to identify and interact with an app. Every app will have its own Application Key. If your app is already on the Distribution Portal, you can find your Application Key on the app’s detail page. Otherwise, create a new app and fill in the “App title” and “Category” fields. Locate the Application Key value and set that aside. We will use that later to register with the Amazon Mobile Ad Network. Next, you will need to add the Amazon Mobile Ads API to your project. For the purposes of this example, we will use Eclipse. Download the Amazon Mobile Ads API (Beta) from here (this should link to our API landing page which has the file for download and the legal verbiage) and unzip it locally. 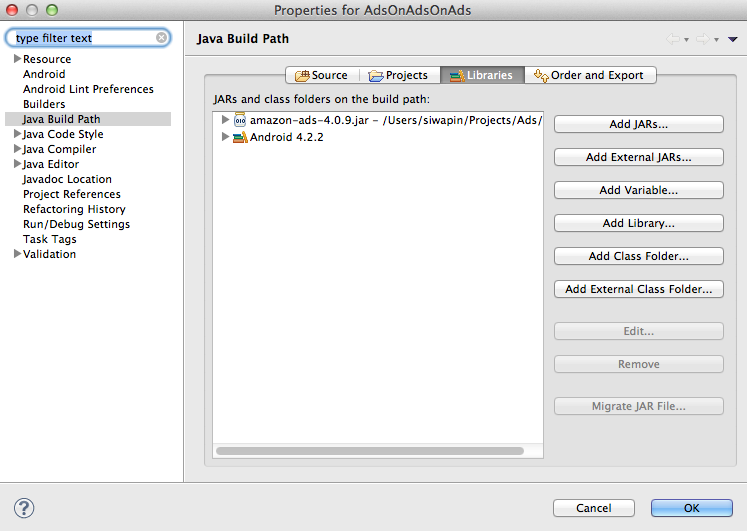 Modify the build path of your project and add the amazon-ads-<x.y.z>.jar found in the zip under the /Ads/lib folder. This step is required to set up ads through the xml layout. 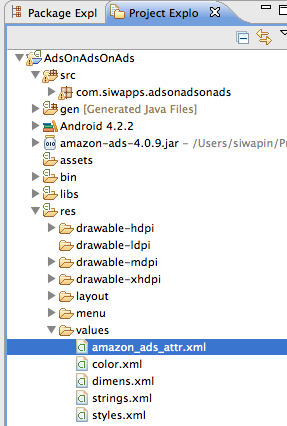 Copy the amazon_ads_attr.xml file from the zip located in /Ads/res/values/ into your project’s res/values/ folder. Now that the project is set up to use the Amazon Mobile Ads API, the next step is to add an ad to the application layout. Set the layout_width and layout_height to match the adSize. 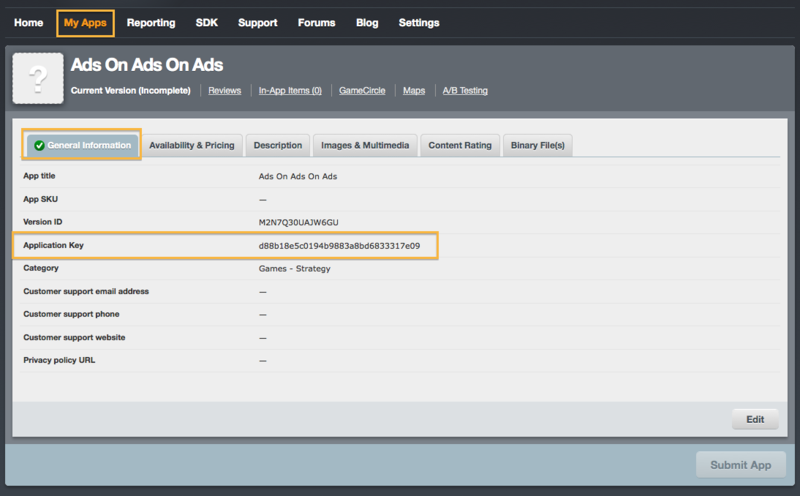 Now we can call the Amazon Mobile Ads API to load ads. Time to put that Application Key to work. In your activities onCreate, call the AdRegistration method to register your app and then call the Amazon Mobile Ads API to load an ad. Please note that you may only use an Application Key to display ads on the specific app for which it was issued. Submit your app to Amazon to display ads to your U.S. users and follow the attribution guidelines set forth here. 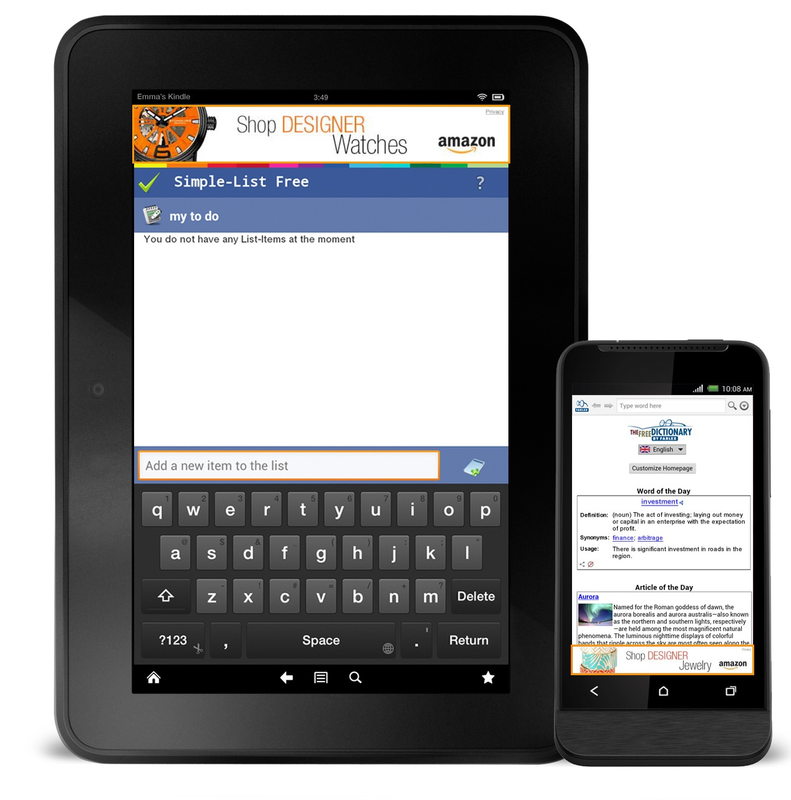 The Amazon Mobile Ads API can also be used with apps that are distributed through any Android stores. Apps that use the Amazon Mobile Ads API may be distributed through any Android store as long as they are distributed through Amazon. Your app is ready to display high-quality ads from the Amazon Mobile Ad Network. This is the simplest of configurations but the Amazon Mobile Ads API has several features for customizing your ad layout, ad targeting, error handling, debugging, and more. Read more about the many features of the Amazon Mobile Ads API (Beta) here. As developers, we’re occasionally (okay, maybe more than occasionally) stuck in the middle between designers who ‘know what works’ and executives who ‘know what they want. Even in smaller shops, it may not be clear which user experience will more often result in the desired behavior. Beyond simple use tracking, testing two different options to determine which works better usually meant two separate APKs and a lot of data mining and management to see which was the best. Amazon has changed that with the release of the A/B Testing Service, where developers can run experiments within one APK. You define the variables to test in each of two variations, and then decide what percentage of downloads will get each variation. The app then collects data and allows you to make an informed decision about which variation you want to enable. These variations could vary from the speed of the ball in a game, or the message displayed while trying to upsell an In-App purchase item like extra lives. It’s easy to configure and integrate the A/B Testing Service with your app and it’s also free for any developer distributing their apps on the Amazon Mobile App Distribution Program for Android. In this post, you will learn how to integrate A/B testing into your app. For our example, we will use the “Snake Game”. In the traditional game, the speed of the snake increases every time it is fed. We will run tests to figure out the optimal speed increment in order to ensure that the game is neither too easy nor too hard for the player and that the player is always engaged. In our case, a successful test would be if 70% - 73% of players are able to feed the snake 20 times before the snake collided with the boundary or the snake itself. This will give us objective data on whether the increment was too high, too small, or just right. Once you have identified your test, you can create an A/B test by going to the Mobile App Distribution page to create it. 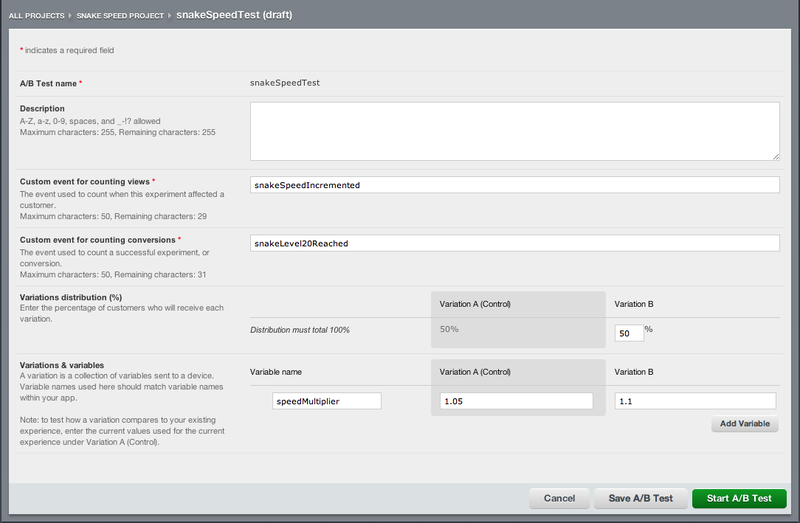 In our example, we will create a project called “Snake Speed Project” and an A/B test called snakeSpeedTest. We will use this to test out various increments in the speed of the snake until we find the optimal one. For more details on how to setup an A/B test, please visit the startup guide. 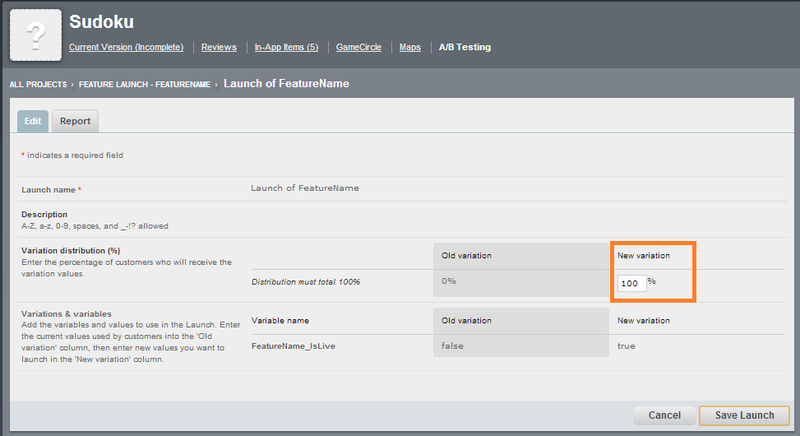 Now that you have a test set up in the Mobile App Distribution page, you’re ready to integrate it into your application. For this, you will need to download the SDK. After downloading the SDK you will need to integrate it into your project. For more information on how to setup your project, please visit Integrate the SDK. Application key – Which can be retrieved by going to your “My Apps” dashboard and selecting the app. One of the properties available in the General Information is the Application Key. Private Key Which can be retrieved by going to the app’s A/B testing page and click on “View Private Key”. You can now initialize the SDK using these two keys. Now that your application is initialized, you can start receiving different variations for your test. In our case, it is the increment by which to increase the snake speed. // record if number of feeds is more than 20. Once you have incorporated the SDK and deployed it through the Amazon Mobile App Distribution Program, you now start collecting data. In our case, we determined that 95% of the players reached level 20 for both test increments, which suggest that the game play was easier than our target. We ran additional rounds of tests by doing launches with new increments and found that the 1.65 multiplier was the optimal level of difficulty, as the conversation rate was around 71%. Refining the increment amounts to do new rounds can be done by just going to the A/B test page. No new APK is required. The Start your first A/B test guide tells you how you can start an A/B test, view results, and end a test. As you can see, setting up and integrating Amazon’s A/B Testing Service is simple and straightforward. The best part is that it’s free for developers of the Amazon Mobile App Distribution Program. 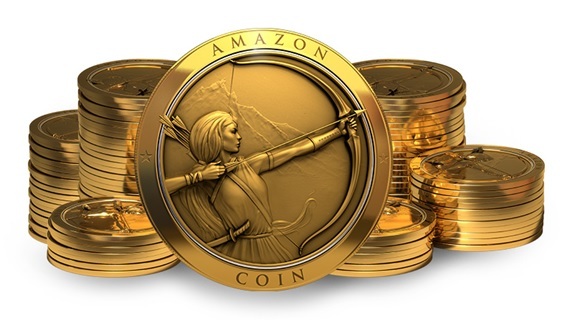 Amazon has started distributing Amazon Coins, which can be used to buy Kindle Fire apps and In-App Purchasing (IAP) items (except subscriptions). Starting today, every U.S. Kindle Fire owner is getting 500 coins ($5) to spend on apps, games, and IAP items. Customers will also be able to buy more coins from Amazon at a bulk discount of up to 10%. 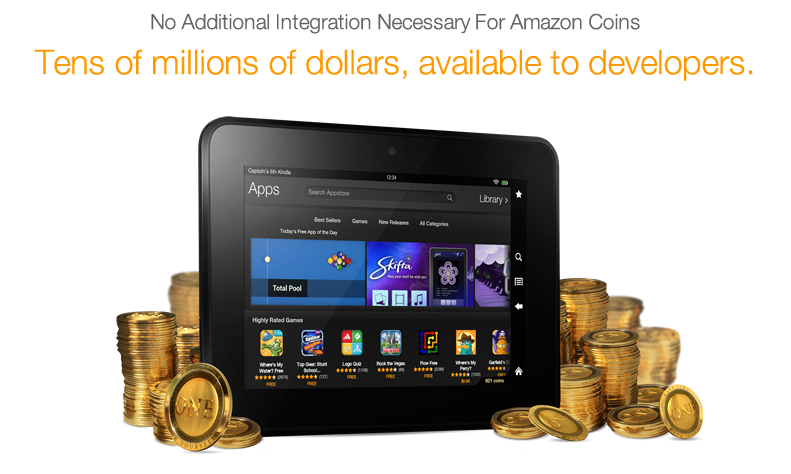 As customers use their coins, you will have the opportunity to make money and monetize your Kindle Fire app. If you don’t have an app for sale on Amazon yet, it’s easy to get started. Based on our testing, over 75% of Android apps submitted to us work on the Kindle Fire, without any additional development required. Create your developer account then submit your app to benefit from Amazon Coins. For more details about Amazon Coins, see the official press release here. Mobile devices create an amazing ecosystem for developers to express new ideas, create new business, and expand existing worlds. Services like GameCircle and In-App Purchasing make those experiences more sticky and re-playable, drawing users into the experience with more depth. Another category of ecosystem depth that we've been focusing on is app-enabled accessories. Kindle Fire (as well as other Android devices) can connect to and control an incredible range of new devices, and a couple weeks ago we launched a few of these devices on Amazon.com as official Kindle accessories, creating new ways and new opportunities for developers to connect with Amazon customers. From the self-stabilizing, Kindle-controllable AR.Drone and the high-tech Nest learning thermostat, to the Sonos wireless music system and the Nexia home automation system, there's virtually no limit to what an application can do with the right accessories. Full documentation on the Hue API can be found on their website. The other devices I mentioned all have programmability interfaces as well. Their own apps hit Amazon a couple weeks ago, but we can't wait to see what other experiences the developer community can create with them! What kind of money is this? In May, Amazon is introducing Amazon Coins, a new virtual currency that customers can use to pay for apps and most in-app-purchase items. To help promote this new currency, Amazon is going to give away tens of millions of dollars in Amazon Coins to Kindle Fire users. This money will be burning a proverbial hole in customers’ pockets as they look for places to spend it. We’d like your app to be one of the tempting places to spend that currency. How do Amazon Coins work? U.S. customers will be able to spend Amazon Coins on apps and most in-app purchase items. (Subscriptions cannot be purchased with Amazon Coins.) Each Amazon Coin is worth 1-cent, so a $2.99 app will cost 299 coins. The way you get paid doesn’t change if the customer pays with Amazon Coins or a credit card; you get paid in real U.S. Dollars, at the same 70% revenue share you normally receive. What do I have to do for my app to be eligible for Amazon Coins? 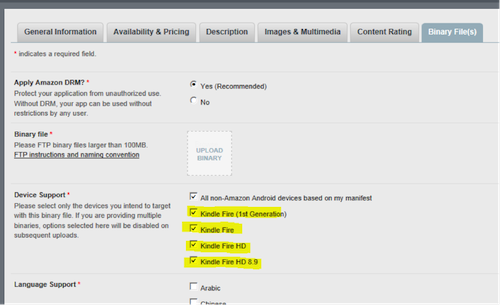 If your app is available for sale on a Kindle Fire device, then you’re done; nothing else to do. It doesn’t matter if your app is also available on other Android devices, as long as it is available on a Kindle Fire device, it is eligible. My app isn’t available on Kindle Fire now. How can I fix that? If you already have an app in the Amazon Appstore for Android, it’s fairly easy to make it available for Kindle Fire Tablets. Take a look at the Kindle Fire Development Best Practices here for hints on how to make your app shine on Kindle Fire, and then re-submit your app with the appropriate Kindle Fire devices selected on the Binary Files tab (see below). Please submit your apps by April 25th to give us the best chance of having enough time to review them and get them in the Amazon Appstore before tens of millions of dollars in Amazon Coins arrive in customers’ accounts. Learn more about these APIs here. For more detailed information on Amazon Coins, see the FAQ for Amazon Coins. Submit for Approval by April 25th--Amazon Coins is Launching Soon! Amazon Coins is launching in May. Tens of millions of dollars of Amazon Coins will be given to customers for free to spend on Kindle Fire apps, games, and in-app items. If your apps are already on Kindle Fire, then no action is required. If you have new apps or games ready, submit them by April 25th to ensure we have time to review your apps before millions of dollars in Amazon Coins arrive in customers' accounts. For more information on Amazon Coins, click here. Stay tuned to the Distribution Blog for more updates and announcements regarding the launch of Amazon Coins. Not familiar with Amazon GameCircle? Read how easy it is to add achievements, leaderboards, and save-to-cloud features to your next game. From a game developer's perspective, the Amazon GameCircle API offers a lot of advantages over home-grown achievements and leaderboards, not to mention data synchronization to the cloud or between devices. It instantly provides a social aspect to your game with very little coding, and simplifies progress saving and back-up (two of the features most requested by customers). GameCircle isn't just about developer convenience, though--customer experience is also critical. We see again and again how integrating GameCircle improves user engagement and conversion, so we know it provides value to game players as well as game developers. More engagement and better conversion leads to increased average revenue per user, so GameCircle may add directly to your bottom line. With this in mind, we've developed a few guidelines to help maximize GameCircle's contribution to your game. These best practices have grown out of our own experience, as well as those of other developers with successful games using GameCircle. If they seem like common sense ways to make the user experience better, you're right. Order – Keep in mind that the first leaderboard listed for your game will be the one to appear on the GameCircle summary screen. Give that slot to a leaderboard that will provide useful information game-wide, as opposed to a specific level or section. The Amazon Mobile App Distribution Portal supports drag-and-drop ordering of leaderboards, so making changes is easy. Descriptions – It seems obvious, but each leaderboard should have a description, making it clear to the player what is being tracked. Draft/sandbox – Remember that leaderboards (and achievements, too) are considered "draft" until they're published from the Distribution Portal. Only players who have been added to the GameCircle sandbox for your app can view unpublished leaderboards or post scores to them. When you're ready to make the leaderboard publicly available, check the appropriate Status box to mark it Ready to Publish, then click Start Publishing. Note that this step cannot be undone, as un-publishing a live leaderboard might lead to a poor user experience if an app expects a leaderboard to be available. However, after publishing a leaderboard, you'll still be able to reset a leaderboard's high scores from the Distribution Portal, which may be useful for weekly quests or contests. Multiple game support – You can easily share one set of leaderboards (and achievements) with multiple versions of your game. If you release separate Free and Paid versions, or offer Standard and High Definition variations of your game, choose one version of your game to be identified as the "master," and then create your leaderboards and achievements for that version only. Then just add the package/signature pair of each version that will use the shared leaderboards and achievements to the “master” whitelist registry. Order – GameCircle automatically shows users the next locked achievement, encouraging them to keep on playing. Arrange achievements in the order they're likely to be earned and they'll be recommended in the same order and the progression will seem natural. 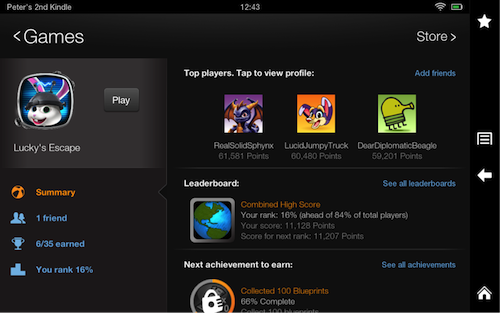 Like leaderboards, achievements may be reordered on the Distribution Portal using its simple drag-and-drop interface. Descriptions – Like leaderboards, achievements should have clear descriptions so players know what they're striving for. You don't have to lay out the precise steps to earn each achievement—hints or a simple phrase are fine—but keep in mind that a rich description may provide more incentive to unlock the achievement. If the description is too vague, earning it may feel like luck rather than skill. Locked/unlocked descriptions and icons – GameCircle allows you to specify different text and icons for locked and unlocked versions of each achievement. Adjust the description for an earned achievement to describe what was done or to congratulate the player. For example, "Defeat the Spider King" may describe an achievement until it's unlocked, after which "You Killed the Spider King!" might be more appropriate. Similarly, the images should be noticeably different. Color is a good mechanism to indicate lock status, with neutral or gray-scale imagery signifying an achievement not yet earned. 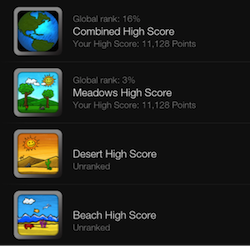 Other options include different backgrounds, an overlay or watermark, or a common image shared by all locked achievements (with an achievement-specific icon for the unlocked state). Use hidden achievements sparingly – GameCircle supports "hidden" achievements, which are not visible to the player until actually earned. Since the user doesn't know about them (let alone how to earn them), hidden achievements are best used for incidental progress—things that might happen through ordinary game play, requiring no specific effort. If your game's achievements are all earned through special actions, you should probably avoid hiding them. Mix up the difficulty – If all the achievements in your game are easy to earn, users may do so quickly and be less likely to keep playing. If the achievements are all hard, there may not be enough regular rewards to keep players coming back. A mix of easy and hard achievements delivers positive reinforcement while rewarding those who put in the extra effort to complete them all. Likewise, you may wish to alternate between incidental rewards and ones that require complicated actions or special effort. As with hidden achievements, this depends on your philosophy—some developers prefer not to define achievements that are awarded through the course of normal game play. If you do choose to include incidental rewards, maintain a balance by offering complex achievements, too. Pace achievements throughout the game – An achievement early on (completing a tutorial, for instance) should kick off a steady flow of positive feedback throughout the game, leading to a final achievement at completion (if appropriate). 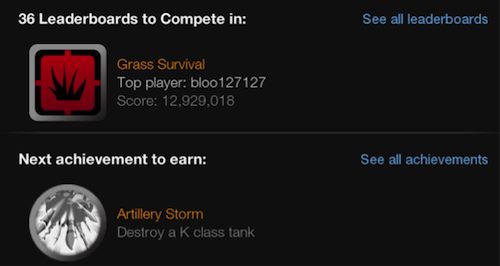 Draft/sandbox – Like leaderboards, achievements are created in "draft" mode by default. This means that they're only visible to players who have been added to your game's sandbox via the Distribution Portal. The process for publishing an achievement is identical to that for a leaderboard, and is also irreversible, for similar reasons. 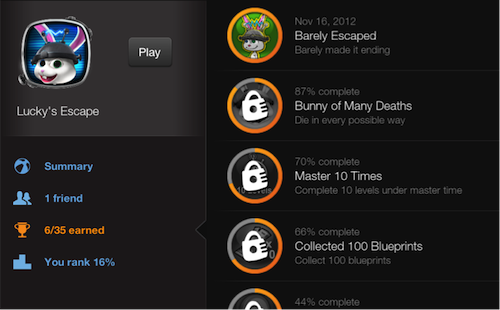 Note that unlike leaderboards, achievements cannot be reset once they're published. Until then, the Distribution Portal can be used to clear an achievement from all users in the sandbox, but that option disappears once the achievement becomes publicly available. Multiple game support – See the note under Leaderboards, above. First sync of the game – Every time your game starts (except on a brand new device—see above), you should call synchronize(). The latest cloud data will be retrieved, if appropriate, or updated, if a local data change is pending. If the data conflicts, the user will be prompted to choose the authoritative source. Sync at major checkpoints, pause, and exit – Whenever a player reaches a significant milestone or stopping point in your game, you should save state to the cloud with synchronizeProgress(). Sync description – It's critical to associate a useful description with each progress update, since this information will be presented to the user in the case of a conflict, or if you allow them to restore to a save point. GameCircle will include the date and time automatically, but a friendly description such as, "Completed Level 3," or, "Round 7: 12 minutes in," can help the player choose which data they want to use. Virtual goods – If you store entitlements locally (that is, you don't handle virtual goods through an authoritative server), it's important to either exclude this data from Whispersync updates or disallow save points. If you don't, a restore to an earlier save point may wipe out your customer's purchases—a guaranteed way to generate complaints. CANNOT_BIND from the emulator – Remember that GameCircle works only on registered Kindle devices, including emulators. If you encounter this error while running on the emulator, make sure you have actually registered and signed in from there as well. You can do this from Settings | My Account. This problem can also arise if the Target is incorrect for the Android Virtual Device you are using. It should start with "Kindle Fire…" to ensure Amazon functionality is available. Don't forget to publish Achievements/Leaderboards – This is a very common oversight, but fortunately simple to correct. Be sure to publish your achievements and leaderboards using the Distribution Portal once your game is ready be made publicly available. Game alias only available if corresponding setting is enabled – If you are unable to retrieve the GameCircle alias/nickname when testing, make sure the appropriate setting is enabled. This is accessible from Applications | Amazon GameCircle. "Share your GameCircle Nickname" should be set to Show. CANNOT_AUTHORIZE due to app signature – Note that on most platforms, the keytool command line program will silently accept the wrong password when generating a keystore signature. In some circumstances, you may need to run the command in the same directory as the keystore you are processing. See Authenticate Your Game with Amazon GameCircle for more information. NoClassDefFoundError at runtime – If your application links without errors but throws this exception at runtime, ensure that the amazon-gamecircle-1.2.x.jar is actually included in the .apk. Simply adding the jar file to the build path is not necessarily sufficient. In Eclipse, for example, you may need to add the file or create a link to it in /libs. No negative leaderboard values – Leaderboards do not currently support negative scores, so you will experience errors if you submit them. Like most developers, you’ve probably sat around waiting for the emulator to start up, or you’ve found the experience of emulated apps slow to use. Although we believe it’s always better to use an actual Kindle Fire tablet to debug your apps, we understand that developers may need to use the emulator to test app compatibility. Wouldn’t it be nice if emulators weren’t so slow? * Our x86 system image using a development computer running Windows 7 with a quad-core 3.10 GHz processor, 8 GB of memory, and AMD/ATI Radeon R6570 graphics. To get the x86 system images for Kindle Fire, you can simply follow our instructions for setting up the Kindle Fire developer tools. There is no new or additional installation required. The x86 system images offer improved performance, especially when the experimental GPU emulation is enabled. Questions? Comments? Feedback? Tell us about your experience with the x86 system images and Eclipse plugin, in our forums. Abu Obeida Bakhach is a product manager for the Kindle Fire developer tools and publications team, where he thinks of ways to make developers lives creating apps as simple as possible. Previously, he was at Microsoft in developer platform evangelism growing the Windows 8/phone ecosystem with open source frameworks. In his spare time, he keeps himself busy catching with his three children on cycling trips.